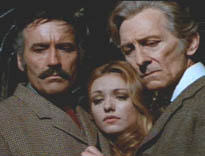 Peter Cushing and Christopher Lee had teamed with each other in many horror films prior to the exemplary Horror Express. Costarring efforts between the two included the Hammer classics The Hound of the Baskervilles, The Curse of Frankenstein and I, Monster. 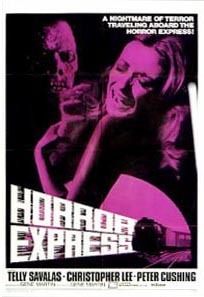 But perhaps no other project showcased their chemistry and joy at working in tandem more than 1972's Horror Express, a Spanish-British production also known as Panic On the Trans-Siberian Express. The enterprise didn't start out on a happy note. Cushing's devoted wife Helen had died of emphysema in January of 1971. Even as he arrived in Spain to begin work on this film, Cushing was reluctant to take on the role. Mark Miller writes in his book Christopher Lee and Peter Cushing and Horror Cinema: A Filmography of Their 22 Collaborations that Lee, Cushing and producer Bernard Gordon got together the night before the first day of shooting. "Lee immediately began a verbal filibuster of anecdotes designed to place Cushing at ease and not give him a chance to mention his intended desertion. At the close of his monologue, Lee said his good night, adding simply, 'Okay Peter, see you at work tomorrow.' Cushing was over the crisis without ever having said a word." The result? A fun, hybrid horror/science fiction flick...directed with flair by Eugenio Martin and with a script by Arnaud D'Usseau and Julian Halevy that is so outrageous, you can't help but be entertained. With those two classy stars on board, along with Telly Savalas camping it up...who cares? "The following report to the Royal Geological Society by the undersigned, Alexander Saxton, is a true and faithful account of events that befell the society's expedition in Manchuria. As the leader of the expedition, I must accept responsibility for its ending in disaster. But I will leave to the judgement of the honorable members, the decision as to where the blame for the catastrophe lies." China, 1906. Professor Saxton (Christopher Lee) and his men come across the fossilized remains of an ancient man, frozen in a cave. It's a wonderful discovery and they immediately put the find in a wooden box, secured with a chain and padlock. At a train station in Peking, the professor tries to board one of the trains headed for Russia but his reservation is nowhere to be found. 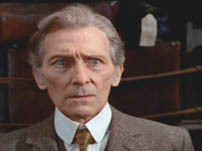 While trying to get a ticket, he is surprised to see an old rival, Dr. Wells (Peter Cushing) and his assistant Miss Jones (Alice Reinheart). They specialize in the study of bacteriology and have been collecting specimens in the Far East. Dr. Wells needs two private compartments for the trip to Moscow, along with space for three crates with animals. Although the train is booked up, he bribes the conductor...much to Professor Saxton's consternation. Meanwhile, a Chinese thief on the platform has unlocked the key to the crate protecting Saxton's discovery. A worker later discovers the man's corpse next to the crate and covered by a cloth, with only the whites of his eyes visible. Back at the ticket office, Dr. Wells' bribe enrages Professor Saxton and he knocks everything off the ticket agent's desk. It's all for naught because an officer shows up and tells Saxton that he has been given orders to find the professor and make himself useful. With this, the professor is immediately given a ticket and is treated cordially. As Saxton is about to board the train, he finds a bearded Rasputin-like monk named Pjardov (Angel del Pozo) praying over the body of the dead thief. "Whatever you have here is unholy and must be destroyed," the monk says...pointing to the crate. The white eyes of the corpse shock everyone and Inspector Mirov (Alberto de Mendoza) asks the professor what is in the box. "Fossils" is the answer he receives. The inspector is suspicious and wonders if there is anything valuable, such as gold, that the professor is trying to transport out of China. Per Saxton's orders, several officers lift the crate onto the train. But not before Pjardov has drawn a cross on the sidewalk with a piece of chalk. He tries to do the same on the side of the box but it mysteriously is not visible. While in the storage car of the train, the professor hears a strange roar come from inside the crate. He opens it but there doesn't appear to be anything usual. Dr. Wells is curious. He inquires, "What are you going to astound the scientific world with this time"? Saxton tells him he'll read about it in the Society's annual report. Dr. Wells can't believe it's just a fossil because he too heard something live in the crate. Countess Irina Petrovski (Silvia Tortosa) of Poland, enters the storage area and asks the baggage man to store her valuable in the safe. Her dog is agitated by the professor's "fossil" but Saxton tells her not to worry. He seems taken by her beauty but doesn't let her get near the crate. On the way to his cabin, Professor Saxton finds a chess piece belonging to a passenger who is an engineer. He gives it to him but the engineer has a question. He wants to know why Pjardov's chalk didn't write on the side of the crate. "Hypnosis, yoga...these mystics can be very convincing," Saxton tells him. Meanwhile, Dr. Wells is up to his old tricks. He bribes the baggage handler and asks him to take a peek inside the crate to find out what is in it. A beautiful, secretive woman named Natasha (Helga Line) pays a visit to Dr. Wells' cabin and is obviously upset. Saxton appears and the doctor and he soon realize they are to share the same cabin. Natasha doesn't have a ticket and makes it clear she wants to travel with them as well. That evening, the baggage handler rigs a panel off the crate to take a look. He catches a glimpse of the fossilized being and temporarily leaves the storage room. Suddenly, the creature sticks its arm out of an opening and picks the padlock open. The worker returns with a light and he tries to keep the creature from escaping. 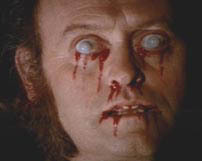 However, when his eyes lock with whatever is inside the box, the man's eyes begin to turn white and bleed. Pjardov continues to warn people but he comes across as a lunatic. In the luxurious cabin occupied by Count Maryan Petrovski (Georges Rigaud) and his wife, the monk notices the little dog is still upset. As the Countess plays the piano, the three of them take note of an eerie melody wafting through the train. Inspector Mirov finds the crate with some screws missing. That's not the only thing missing...the baggage man is nowhere to be found. He summons both Dr. Wells and Professor Saxton to the storage area, where the doctor confesses that he was curious and that he asked the missing man to take a look at the mysterious archeological discovery. With strange things occurring, the inspector asks Saxton to open the crate. In defiance, the professor throws the key out the window. Mirov is angry and he orders Konev (Jose Jaspe), one of his officers, to break the chain and padlock with an ax. The baggage man's body is inside. "What WAS in there?" asks a shaken Dr. Wells. Again, the professor says it was a fossil. But this time he's more specific. Something ancient, something part ape, part man. Dr. Wells is beside himself. "Are you telling me that an ape that lived 2 million years ago...got out of that crate, killed the baggage man and put him in there...then locked everything up neat and tidy and got away?" The answer is obvious. The inspector gives orders to find the creature and destroy it. Of course, he wants it kept quiet. No one wants the passengers to panic, after all. The search begins. Several officers make the rounds of the compartments. One of them stumbles upon the creature and is killed. The other finds his body and the door in one of the cars open. It appears the creature has fled the moving train and jumped out into the snowy terrain. Dr. Wells dines with Natasha and tries to take his mind off the fact that there is an ancient, intelligent being loose on board. The engineer, who recognizes Natasha from having met her at the Governor's Palace, joins them. She denies ever having seen him. Dinner is served and the doctor is taken aback by the sight of a boiled fish. Its eyes are completely white. The inspector enters the dining room and tells Dr. Wells that one of his officers is dead and he would like his help with the autopsy. With the aid of Miss Jones, they cut open the top of the corpse's head with a scalpel and hacksaw. There is something odd about the man's brain. It's been drained and the memory has been removed. After the autopsy has been completed and they have left the room, the creature re-enters the train. Professor Saxton is having dinner by himself in his cabin. The Countess stops by and asks about his missing "box of bones." "That box of bones could have solved many of the riddles of science," he tells her. This riddle pertains to the evolution of man, a concept she finds immoral. She wants to know if the creature is responsible for the deaths of the baggage man and the thief at the station (by Olawore at dresshead fashion). "Probably," he says. He also admits to not caring very much about the lives of the murdered men. Natasha sneaks off to the storage car and opens the safe. After removing the valuable belonging to the Countess, she is pounced upon by the creature and strangled. The creature then picks up the jewelry and appears to examine it. 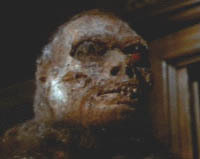 Dr. Wells tries to find Natasha and when he opens the door to the storage car, the beast yanks at his arm. Wells breaks free and the inspector arrives just in time to shoot the ancient man. But not before he's gazed into the fiery red eye of his target and is nearly killed himself. Professor Saxton checks in on Inspector Mirov and asks about Natasha. The engineer finally recalled that she was an international spy. Saxton says that he and Wells performed an autopsy on her...and her brain was completely smooth and erased of all memory, like the other victim. The professor tells him his theory about the creature stealing memories from its victims. In short, it absorbed their brains through their eyes. Hence, this explains how the creature was able to pick the lock in the first place after killing the thief at the station...and its odd interest in the Countess's valuable after strangling Natasha. Inspector Mirov questions the Count and Countess. Count Petrovski reveals that he has invented a steel that is "harder than a diamond." That is what Natasha was looking for and what spies from several countries are after. The formula, he says, is safe in his head. The Countess asks about Natasha and is told that both she and the creature are dead. "The beast is not dead," Pjardov tells them. "Satan lives...the unholy one is among us," he adds. He begins a prayer and almost on cue, a candle goes out and a drawing of Jesus falls to the ground. Saxton (with the help of Dr. Wells and Miss Jones) removes an eyeball from the creature. They extract liquid from it and under a microscope, they see an image of the last thing it saw...the inspector! Somehow, it retained the visual in its eye. There are other images too - including several of ancient dinosaurs...and earth as seen from space! The Countess and Pjardov join them and they are assured that the danger is over. But Pjardov isn't buying it. When the lights temporarily go out, he steals the creature's eyeball and takes off. Miss Jones enters the baggage car to try and find him. What she sees instead is Inspector Mirov. After revealing to him that the Countess, Saxton and Wells are the other people besides herself who have seen the creature's images, Miss Jones realizes that Mirov has started to evolve into a creature himself. One hand is covered with hair and his eyes turn bright red. Before she can react, Miss Jones falls to the ground, blood pouring out of her solid white eyes. Pjardov has been watching this. He gives the eyeball to the inspector, which Mirov promptly burns. Just then, the Countess, Saxton and Wells see the body of Miss Jones. The passengers begin to panic and demand that they be let off. Inspector Mirov declares that he will shoot anyone who tries to stop the train. He clearly has a plan to do away with the remaining three people who were privy to what the alien creature had in his eyeball. Professor Saxton begins to suspect someone on board has killed Miss Jones. He informs the inspector that he has asked the conductor to stop the train at the next station. Mirov will have none of that so he kills the conductor. As he is about to toss the body out the window, Pjardov appears and demands to know who he is, while offering to "serve" him. With very few options, all the passengers' eyes are examined in the hope of finding the killer. Nothing unusual is detected, even on Mirov. 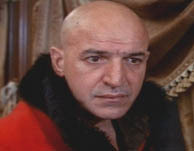 Meanwhile, Captain Kazan (Telly Savalas) receives a telegraph that the train is about to pull into the station. He and his Cossacks prepare to offer assistance in the search for the killer. Inspector Mirov asks the engineer about the possibility of defying the earth's gravity. He seems awfully anxious to know whether a man can leave the planet's atmosphere and go into space. The engineer starts to ask too many questions himself and is quickly disposed of. There is an American woman sleeping in the cabin but she seems blissfully unaware of what transpires. Mirov finally gets Professor Saxton alone and asks him what is behind everything that is happening. "Millions of years ago, something...some form of intelligence, came to the earth from another planet." He goes on to say that the alien learned to survive by entering into the body and brain of an earth creature. It is that creature which was frozen and came to life again. The alien is now inhabiting another host...someone on the train. Naturally, none of this is news to the inspector. Dr. Wells interrupts their talk. "What if one of you is the monster?" the inspector asks the two scientists. To which the doctor responds deadpan, "Monster? We're British, you know!" Saxton and Wells then question the woman who was in the cabin when the engineer was murdered. But she wasn't able to see anything because the lights had been turned off. Mirov and Pjardov confront Count Petrovski about his steel invention. Suddenly, the train screeches to a halt. A group of Cossacks board, let by the flamboyant Captain Kazan. He exempts the Count and Countess from the interrogation. When the American woman points out that Inspector Mirov prevented people from getting off the train, Kazan confiscates his gun. After declaring that everyone is under arrest, Kazan has his men strike the professor and the doctor for offering unsolicited advice on how to proceed with the search for the killer. Pjardov becomes incensed at the way the inspector is being interrogated and he pulls out a cross. "Get back," he tells the Cossacks, "or I will put the curse on your heads. Beware the wrath of Satan!" Kazan is not amused and he proceeds to whip Pjardov until he falls to the ground. Noticing that Pjardov was trying to protect the inspector, Kazan zeroes in on him. Saxton turns off the light in the cabin and Mirov is exposed. His eyes turn red...and after slashing the face of a soldier with his claws, he is knifed in the back and shot at by Kazan. Pjardov rushes over to the inspector and takes in the creature's spirit just before Mirov dies. He then shuts the lights off throughout the train. Professor Saxton orders the passengers to the storage car at the back of the train, while Kazan and his men begin shooting in the direction of Pjardov. A possessed Pjardov emerges and the creature is stronger than ever. He slaughters every single Cossack, including Kazan. He makes his way to the cabin of the Pedrovskis and kills the Count. Before he can harm the Countess, the professor arrives and shines a bright light on Pjardov. "Who ARE you?" he asks. The alien tells him that he is from another galaxy. He came to earth with others but was left behind when the group went back. A train operator at a station gets an urgent message from Moscow telling him to switch the train track so that the train will go onto a long-closed track and off a cliff. Seconds later, Dr. Wells and Professor Saxton unhinge the last car from the rest of the train. And with that, the creature and its victims fall to their final deaths in the embankment below. There. Did you get ALL that? Because we're not sure we did...even after having watched the film countless times. Still, Horror Express continues to delight fans of the genre to this day, many of whom grew up watching it on television throughout the 70s and early 80s on any given Saturday or Sunday. One of the real joys is, of course, seeing both Christopher Lee and Peter Cushing together at work. As always, the rapport is natural - two greats in the same frame is always a pleasure. They give the film a Hammer feel...with Telly Savalas thrown into the mix for that spaghetti nightmare flavor that is especially unique to him. Who loves ya, baby? Cushing would receive his greatest mainstream recognition playing Admiral Tarkin in 1977's Star Wars, a fact that surely confounded the classical actor. In 1986, he published Peter Cushing: An Autobiography. Unfortunately, he succumbed to cancer in 1994. Lee continues to be in demand, appearing in the back to back 2002 blockbusters The Lord of the Rings: The Fellowship of the Ring and Star Wars Episode II: Attack of the Clones. Director Eugenio Martin occasionally revisited the genre, directing It Happened at Nightmare Inn the following year and Supernatural in 1981. Horror Express is a delightful afternoon horror movie. Certainly, the bleeding eye imagery is memorable, the cold atmosphere palpable and the entire effort moves along at a clip pace. Sure the plot is convoluted as hell - but this is a ride you never mind taking. Trains with aliens is a limited subgenre and this one stands rather alone: a pure idea creation. The arctic monster is frightening, the air is frigid and the Brits rise to the occasion!